In the Middle Ages astronomy was one of the seven liberal arts along with grammar, rhetoric, dialectic, arithmetic, geometry, and music. In the Convivio Dante proclaims the nobility of astronomy as a science, praising its "high and noble subject, which regards the movement of heaven, and high and noble because of its certainty, as coming from a most perfect and regular principle" (Convivio, Bk. 1, chap. 13). 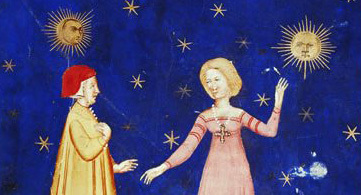 The importance of astronomy for Dante is evidenced by the many astronomical references in the Divine Comedy. Dante's Heaven and Hell are Aristotelian in nature and form. Dante's notion of a corruptible and ever-changing earth surrounded by a series of immutable, nested crystalline spheres whose perfection increased with their distance Earth, was derived from the Greek philosophic tradition. While the Pythagoreans established the sphere as a perfect, if not divine shape, Aristotle synthesized earlier conceptions of the heavens into a cosmology congruent with his physical laws. Aristotle consigned everything that is corruptible and imperfect to the sub lunar realm, the region of the universe inhabited by the people and the animals of the Earth. Divinity and perfection were reserved for the celestial spheres -- the Moon, Mercury, Venus, the Sun, Mars, Jupiter, Saturn, and the fixed stars -- with the sphere of the moon being the lowest and least perfect. The celestial bodies that governed the spheres were made of an altogether different, ethereal substance; each heavenly sphere becomes more perfect as Dante travels closer to the highest heaven, the sphere known as the Empyrean where God resides. Dante's Hell also reflects he hierarchical structure of Aristotle's heavens. Just as the heavens become more perfect as one ascends through the crystalline spheres so do the circles of Hell become more evil the closer one approaches the center of the universe. At the center, to which everything heavy and Earth-like is drawn to, we find Satan appropriately positioned at the point farthest from the most perfect heavenly realm. This complicated universe of nested circles and imaginary points in space survived mostly intact for 1400 years until Copernicus revived the idea of the sun-centered universe as a more elegant way of preserving the phenomena of uniform, circular motion. During the Middle Ages, the Ptolemaic model of the universe would have been used to calculate the positions of planets with respect to the fixed stars. In the Divine Comedy Dante included many lessons in astronomy, particularly in Purgatory, where he frequently alludes to the positions of the sun, moon, and other planets in order to indicate the time of day. Intellectuals of Dante's day would have been able to use an astronomical table such as the Perpetual Almanac of Prophatius, the Marseilles Tables, or the recently completed Alphonsine tables in conjuction with an astrolabe -- a two-dimensional model of the heavens -- to determine the positions of the Sun, Moon and planets with respect to the fixed stars. 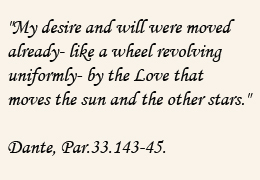 Perhaps the most eloquent testimony of Dante's reverence for astronomy is his use of the word "stars" at the end of each canticle. As the poem's numerous astronomical allusions show, Dante was a keen observer of the heavens.